We can support you to improve business productivity and the employee satisfaction by 20-30% through our organization change program. 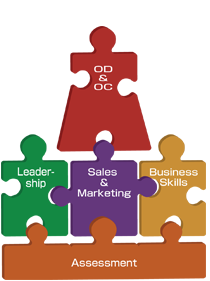 Our OD experts will surely help maximize members and organizational performance. We will be partnering with you to create high performance capability and culture, bringing out the best in your members. Our leadership and executive development programs constantly deliver tangible and significant results in leadership behaviors, member engagement and team performance. Participants can learn and acquire not only research-based theory and knowledge but also effective practices and tools tested in vaious global companies, such as P&G. We will help you increase business results and customer satisfaction through enhancing your members sales and marketing competencies – skills, knowledge, procesess, mindset, habits and practices. Our High IMPACT Selling program has helped more than 3000 companies, and constantly received business training award in the United States. We help you acquire state-of-the-art global business and communication skills needed for business professionals working in global economy, such as innovation, problem solving, communication and negotiation skills. We use experiential and action learning, our programs deliver tangible changes in participants behaviors and performance from Day1. Also, we support clients to internalize their training program. The HPO organization survey is a diagnosis tool of the management ability and the organizational strength to improve organization performance and health. Also, we have various holistic human resource assessment tools which have supported more than 10,000 leadershipt development in global companies in recruiting, development, promotion and coaching.